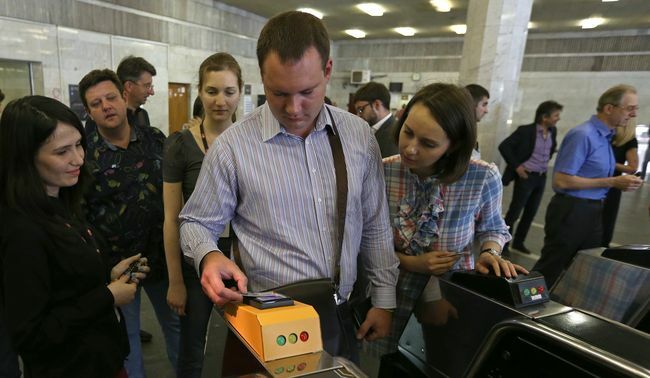 From now on, Kyivites can pay subway fare by means of noncontact Master Cards. This service is now available at 17 stations: Khreshchatyk, Teatralna, Zoloti Vorota, Ploshcha Lva Tolstogo, Maidan Nezalezhnosti, Poshtova Ploshcha, Kontraktova Ploshcha, Palats Sportu, Arsenalna, Universytet, Politekhnichny Instytut, Shuliavska, Olimpiiska, Palats Ukraina, Lukianivska, and Klovska, Ukrinform reports. Incidentally, noncontact payment has been introduced in partnership with the company Master Card and the joint-stock company Oshchadbank. To make the payment, one must just bring the banking card close to the turnstile, and an amount that equals the fare will be automatically withdrawn from the card. Therefore, passengers will no longer have to stand in a line to ticket windows or top up on their plastic tickets in advance. In addition to noncontact Master Cards, the turnstile also processes and accepts for payment the now customary noncontact plastic subway tickets, social security cards, and tokens. “Any form of electronic transport fare payment is a very good thing, for there is a great deal of the gray economy in this sector, and e-payments will immediately clear up the situation – it will be possible to register in no time and introduce a flexible payment mode depending on the station,” says Yosyp VINSKY, ex-minister for the infrastructure. In his words, any card payment is also very convenient, for this operation goes though a bank account and is immediately recorded. “So, I think it is, firstly, modern; secondly, fast; and, thirdly, transparent. In any case, we should welcome payment by card. This is a promising trend all over the world. And, in my view, it is somewhat behind the times to walk around with subway tokens in pocket,” Vinsky adds.